The Sarah Palin of BC politics currently occupying the premier’s chair is convinced that LNG is both an economic saviour and a way to reduce GHG emissions. It is, of course, neither. Our newly elected Liberal government in Ottawa – elected on promises to reduce GHG and committing in Paris to hold global warming below 1.5℃ – is now wavering. Not only because they allowed the Woodfibre LNG plant to go ahead, despite the very obvious shortcomings of the current (i.e. previous Conservative, Harper driven) EA process. But also because of the re-election of Brad Wall, which was obviously what Catherine McKenna must have been worried about when she started talking about national unity as being more important than the survival of life on earth. 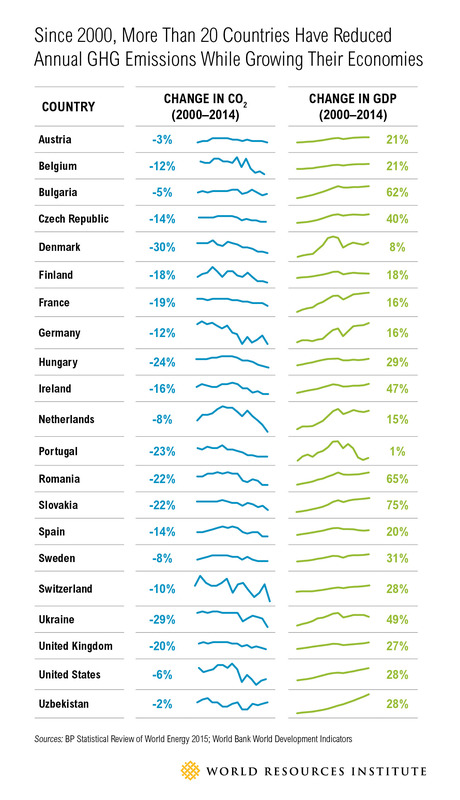 So what Vox did was reprint a table from the World Resources Institute which shows that 21 countries have managed to reduce their GHG since 2000 while at the same time as increasing their GDP. By the way, the stated reduction in US emissions is has been shown to be wrong, mostly because of the way they have counted methane. You will notice, of course, that Canada is not among them. BC, of course, had been following a somewhat different track thanks to its adoption of the carbon tax. But that progress has been slowing, as the carbon tax has been stalled, and so much attention is now devoted to exporting fracked gas. Not only is the market for LNG now swamped, so that finding a customer for BC LNG will not be easy despite our generous tax and royalty regimes, but the way that methane leakage from fracking and LNG processing is measured has been updated with better data to show that it has little advantage over coal in reducing GHG. There is no one answer to how this decoupling has been achieved – but there are some useful pointers in the article you just have to scroll down below that big table. But also there is, in BC, at present, a really good analysis of just how BC can improve its performance. And if you suppose that it might just be possible that none of the proposed LNG plants actually get built, and we elect a government in BC that is actually serious about reducing both CO2 and CH4 emissions – as opposed to just taking credit for past success – then progress does actually seem possible. Although if we try to do both, it’s very unlikely. At the time of writing, there is still time to make yourself heard as part of the consultation on the BC Climate Leadership Plan. But even so, the table above ought to enough to silence the people who keep talking about growing the economy and saving the environment as though they were at odds with each other. Oreskes said Canada cannot seriously address climate change while also building more giant pipelines to deliver Alberta’s oil sands bitumen or British Columbia’s fracked natural gas to proposed export terminals on both coasts. B.C. Premier Christy Clark similarly promotes liquefied natural gas as a climate solution: a “bridge fuel” to help China get off dirty coal power. There is a Canadian Press story this morning which got covered by the CBC, where it caught my attention. One year of logging old-growth forests in southwestern British Columbia blows away a year of carbon reductions accomplished by initiatives like the carbon tax. 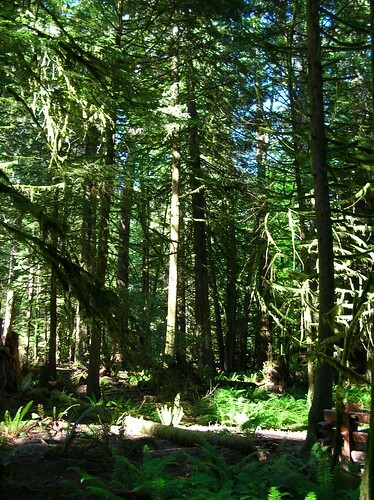 That’s the finding of a Sierra Club report released today, entitled Carbon at Risk: B.C.’s Unprotected Old-growth Rainforest. That’s the top of the CP/CBC story – and you can find the same thing elsewhere. In fact I think you should. For a start, missing from the CBC story is any substantive content that they have added – and, even worse in my opinion but common to most news web sites, there isn’t a link to the report. For a better example go to Huffington Post which has the same CP story but at much greater length, and with an interesting back and forth between Rick Jeffery, Coast Forest Products Association president and Sierra Club spokesman Jens Wieting. But also no link to the report. In fact I actually talked to Jens Wieting myself this morning. First of all I did not even know that there is more than one Sierra Club – but I guessed that Sierra Club Canada was probably the source. Wrong, it’s actually the Sierra Club BC. Their web page is actually much more active and has the press release – but that doesn’t link to the report either. Jens sent it to me by email, but you can download it from the publications section. Its a six page pdf but worth a look. I am not at all an expert in this field, but I have some connection to it. 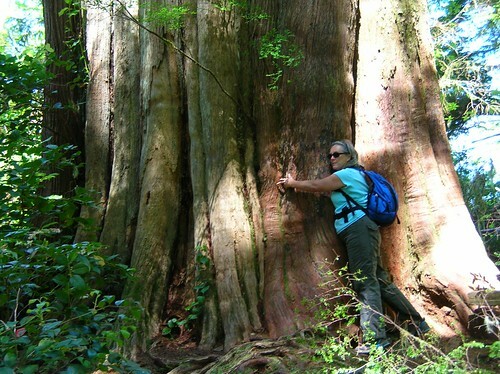 I would have had a job at the Forests Ministry had not the BCGEU “bumping” practices snatched it away from me. I did do quite a bit of research before the interview – and he who did the bumping didn’t have to – so I have been a bit more aware of the issues since. I have been in BC’s old-growth forests – there’s small patches on the North Shore, but more impressive are Cathedral Grove and Meare’s Island. 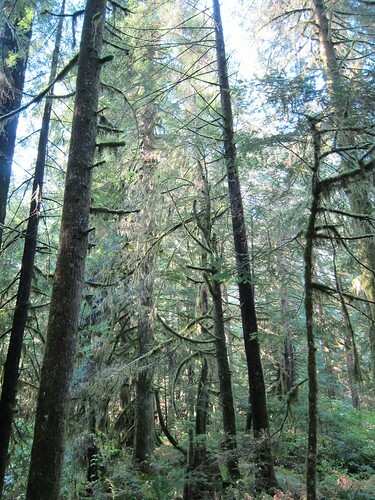 Increased conservation of the remaining old growth temperate rainforest, phasing out logging of old-growth and transitioning logging fully to second growth is urgent from a climate adaptation and mitigation perspective. Improved forest management, in particular longer rotation, eliminating waste and selective logging, is equally important to reduce carbon loss. Forestry can be an important sector of the low carbon economy of the future, but not without increased forest conservation and improved forest management. Perhaps if Jeffery had stuck to what he knows about – what his members are doing or proposing to do – and providing some source material to back that up, he might have some credibility. But by first claiming that he knows what the Sierra Club wants – and then calling them liars for their much more nuanced approach – it is not an end to logging that they are calling for – he discredits himself and his employers. Of course if you are a business you want to maximize your return on investment – that’s what business does. But businesses that want to be around for a while, that do not want to be treated as social pariahs and have some understanding of the concept of sustainability, rather than simple greed for short term profits – do better in the long run. No they’re not. What they are actually saying is that clear cutting releases a lot but not all the carbon – and the report uses the rather generous assumption that about a quarter of the carbon is stored. And there is a picture of slash burning to illustrate what actually happens in the woods when they cut the trees down. There is a also in the CP story as printed by HuffPo some policy issues with quotes from BC Ministers – again something the CBC misses altogether. But rather than get into that, I do think that what is being demonstrated is that the BC carbon tax is an increasingly flimsy pretence at doing something about greenhouse gas emissions, that is more than offset by all the other activities of the present administration. Perhaps it is indeed the right way to do accounting, to log the burning of our exported coal, oil and natural gas against the nations that burn it. But if we weren’t subsidizing the extraction processing and transport of these fossil fuels, they would cost a great deal more, would be less attractive and those nations would look to other sources of energy. Renewables would be much more attractive to them. The whole world would be better off if we left more of the oil, gas and coal in the ground. We would also be much better off if we stopped logging old growth forests (especially by actually being honest about how much carbon is released when they are cut and how poorly second growth compares at carbon sequestration). And when we do cut down the trees, we do a great deal more than simply ship off the raw logs elsewhere. Something I missed on Friday was brought to my attention thanks to the ever useful BCEN LW list (hat tip to the indefatigable Bill Henderson). So the near universal dismay at the tactics adopted by the NDP and the Conservatives on the issue of the carbon tax is worth remark. Gordon Campbell started the ball rolling – and to emphasize its revenue neutrality he sent a $100 cheque to every “man woman and child in BC” to offset the impact of the new carbon tax on energy costs. Only later did he realise that he would have to give it back to municipalities too – and he has yet to give it back to BC Transit or Translink. But all that did is make everyone cynical. And of course we heard a lot from those who were convinced it would cost them a lot more than $100. And the timing was off, because of a sudden brief spike in oil prices which happened to coincide with the announcement. Stephane Dion stole the Green’s policy – becuase they had published their platform long before anyone else – but also ran into credibility problems. Probably not his fault either – but we all have long memories of earlier Liberal Red Books, and the rather dismal failings of the Chretien and Martin governments that just seemed to be a paler shade of blue, not green (or red, come to that). Nancy Olewiler, a professor of economics at Simon Fraser University, was one of 230 economists at Canadian universities who signed an open letter advocating putting a price on carbon. The economists favoured a carbon tax because it provides more certainty on the price of polluting and is less complicated and costly to implement than cap and trade. Reducing emissions will inevitably cost money and part of that cost has to be passed on to consumers, to encourage the use of cleaner fuels and energy, Olewiler said. “If a cap and trade system is to work effectively to reduce emissions, it would have the same impact as a carbon tax,” Olewiler said. And if 230 economists all say it, I think governments had better listen. 350ppm is not an easy target to hit but it is a far more realistic one than Kyoto – and now much more urgent. Business as usual is not a sustainable option, and as with any fundamental change we cannot expect it to be entirely comfortable, although of course there have to be safety nets for the vulnerable. Unfortunately we seem to have used up all our fiscal headroom in making sure the enormously wealthy are taken care of first. Which is like reserving all the lifeboats for the first class passengers. Can we change in time? I have found that the BCEN Landwatch list serve is an endless source of leads, discussions and debate about a wide variety of issues, some of which finds its way on here. As noted I spent part of Sunday at the BCEN conference, and naturally the most important issue cropped up there too. And it is not the rerun of the Wall Street crash, but the fact that human life on this planet is now seriously threatened by global warming. All of the former predictions were indeed wrong. It is all happening much faster than anticipated. We will now see an ice free North Pole in a matter of years – not the next century. The loss of the polar ice cap means less reflection of sunlight and more heat absorbed by the oceans. So the sea level rise and ice melt is speeding up and at the same time frozen methane in the deep ocean has begun to bubble up to the surface. And methane is twenty times more powerful a greenhouse gas than carbon dioxide. Up until recently most of the discussion of greenhouse gas reduction has been in terms of what percentage of reduction is needed over some baseline year. But what scientists are now saying is that we have to look at the cumulative effect. Because the greenhouse gases once emitted tend to accumulate, because we have been busy destroying the natural processes that used to absorb CO2. So attention is now focused on what concentration in the atmosphere is “acceptable”. Or in other words, if we going to avoid a catastrophic warming (4 to 5 degrees C) and just get a mildly disastrous one ( 2 degrees C) what concentration of CO2 in the atmosphere should we aim for and how fast do we need to move? Bill Henderson kicked off this exchange, and, as so often is the case, when Pamela Zevitt responded I heard myself say “I wish I had written that”. So I asked her if I could reproduce it here. She insisted on rewriting it a bit (to make the context clearer) and I am including Bill’s original post too. I’ve also been reading HOT AIR by Simpson, Jaccard and Rivers, a good read on emission reduction politics in Canada. Funny thing though, even though this book is less than 2 years old there is no mention whatever of the tipping point, abrupt climate change (CC), latent feedback, irreversible CC danger – these well meaning, very smart, very informed authors stay completely within gradual CC – temperature increase and local problems throughout Canada’s differing regions is the danger. Therefore their prescription is a gradual implementation of emissions mitigation with finance instruments which will not disturb business as usual (BAU). They even use the thin edge of the wedge metaphor – after dissing Stern in favour of Nordhaus. What you end up with is the BC CC mitigation program. But surely by now Jaccard and Campbell as well as May, Layton, Dion and even Harper have moved to understanding CC as an immediate danger, that we are close to going over a melting Arctic tipping point to a CC that isn’t mitigatable and which promises to destroy our civilization. So why are we still arguing about $10 dollar carbon taxes and pretending to make reductions were not going to as GHG emissions continue to rise, and not only in the developing world making products for us, but still in Canada too? How powerful is the BAU frame that our leaders self-edit about this most important emergency situation? What sort of leadership is this? Are you content that the powers that be are aiming to stay under 700 ppm instead of 350 ppm? Lets not focus too much on why one piece of the solution puzzle doesn’t give us the action oriented answer we want. Having had the opportunity to meet and discuss the issues of tax shifting with with Mark Jaccard one of the architects behind Climate Change and economic policy shifting in BC I would say that yes, I think he and others working on the issue understand the immanency and urgency of taking action. The problem is people keep fixating on tax shifting or other paradigms that are directed at affecting social behaviour change and then ask why those who suggest such solutions don’t seem to recognize we may not be able to wait for the “social marketplace” to sort things out. We see the world set to burn long before we see the positive outcomes of those shifts. But I see the work of Mark and others as being the best use of skills that can create essential analytical tools to model and predict change to social and human capital behaviour (whether some think it useful or not to do so). Just as I as a conservation biologist and many of my colleagues work to influence land use policy or species legislation to force decision makers to stop putting humanity at the center of the universe. Mitigation while not necessarily the immediate action needed in some cases, is still a valuable if implicit means to raise alarm bells on how the complexities of earth’s systems are about to crash. Those that choose to work at influencing policy choose to do so because it is an (albeit indirect) route that many politicians buy in to. I don’t chain myself to trees, even though I have very deep core beliefs about their value because I know it is not how I will be able to protect them most effectively. I think every leader on the planet who has half a brain cell is a little troubled, some hopefully down right scared and certainly most must be aware of the worst case scenarios about climate change. But no matter how much we ask ourselves how it is that they don’t see what is happening, why they don’t have the necessary epiphany many of us have had and extinguish their apathy and sycophantic worship of the GDP, I don’t see them actually being the leaders of change. Globally, human society is stuck in a rut of growth, consumerism, waste and denial, and if that is what the masses demand then that is what the politicians provide (at least as far as mass societal gratification goes). As a biologist I have theories about why this is happening, even though it makes no sense for a species to behave this way. All I can say is that I think we are seeing a very bizarre result of several factors coming together including population growth, technology and cause and effect related to our abstraction and disconnectedness with the natural world. Topped off with a drive to maximize survival of the individual. Our intelligence while allowing us to flourish past normal checks and balances most other species deal with has put us out of synch and that has caused a whole lot of rippling feedbacks, and not good ones. Still, if the pattern of our species ebb and flow on this planet has shown anything we are not necessarily beyond redemption (yet). We need to be working holistically from all fronts. Policy that hopes to change human consumption driven behaviour will be part of many potential solutions that will most likely include catastrophically painful sacrifices and a huge paradigm shift to a deep ecology based life. Regardless of whether we feel one course of action today to be ineffectual or inadequate to affect tomorrow, my feeling is that we will still most definitely be ‘hooped’ if our species cannot start to think collectively outside its myopic self gratifying monkey brain. For what it is worth, Bill Rees has a somewhat similar conclusion. He is convinced we will come up with a solution. In fact he says there are two possible routes. The first one is an extension of what we are doing now – fighting for the resources (currently oil). The second one is that we in the developed world start a bargaining process which means we voluntarily surrender some of resources to India and China, but are smart enough to find ways to be more efficient that our fundamental needs and much of our desirable lifestyle is not lost, while they can the catch up to us. But note that it starts with us setting a good example – not doing the current dance about we won’t cut until the Chinese do. I hope he is right that we will not do the first – but obviously that means a change in political leadership. If the neoconservatives are re-elected here and in the US, I would expect the warlike stance to continue. Which is to say we continue to behave like chimps. 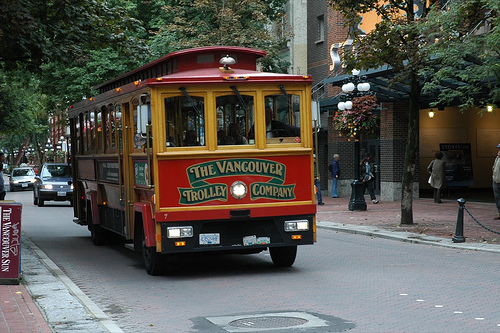 I must admit I was a bit startled by the idea of trolleybuses in Nanaimo – especially when it is said that “$200,000 [is] required to establish the service”. It is one thing when green pressure groups and political parties start asking you for $100 – it is quite another when a municipal government does so. I also take more than a little umbrage at the Premier signing the letter that heads the cheque – and the little pamphlet that also tels me how to spend my money that they are giving back to me, to offset the carbon tax I will be paying. We have NOT got $100 extra each. We have had some of our income tax returned to us so we can pay our carbon tax. All the rest is spin. And from a government that includes highway widening in its greenhouse gas reduction plan on the utterly bogus premise that widening roads reduces traffic congestion. All these so called “green alternatives” are trivial in comparison. Gordon Campbell knows that “you cannot build your way out of congestion” – that is a direct quote of what he has said more than once. And if you really want me to reduce my power consumption – how about a law which trumps silly strata title rules like “no washing lines” and “no solar panels”? Following up on that piece about Carol James, she seems to be reacting to polling data. The Province this morning has the figures from the latest Ipsos Reid poll which shows that while people hate the gas tax that has yet to be translated into hating the Liberals. Which is very strange indeed. The trouble with the tunnel-visioned eco-idealists advising the premier is that they can’t see outside the narrow confines of their own obsession. There is nothing much narrow about the concern that, at the present rate of progress, humanity seems likely to be massively reduced on this planet, if not wiped out altogether. For the other species we have been decimating this may actually be a bit of a relief. Like I have said before, the planet will still be here a thousand years from now. The future for us seems a great deal worse. The new ecology will work as well or better. We won’t be here to see it. This is obviously a new defintion of “eco-idealism” that had not previously occurred to me.